Pistons- Field Goals 37-89 (41.6 percent), 49 rebounds, 22 assists, 3 blocks. 76ers- Field Goals 44-90 (48.9 percent), 40 rebounds, 26 assists, 12 blocks. Detroit lost their third consecutive game as they were chased and hunted in the last quarter by the 76ers. These losses are tougher to swallow as all of them have come on their home court. 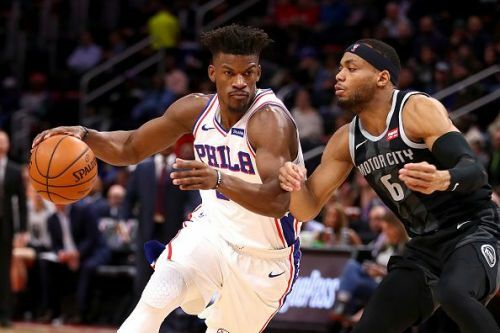 76ers rallied hard late in the fourth quarter to a 13-0 run which changed the course of the game. Joel Embiid watched the Sixers win from the bench as he was rested for the match. Andre Drummond took advantage of the situation and posted a double-double with 10 rebounds and 21 points. Griffin also put a valiant effort with 31 points, 12 rebounds and 6 assists in the loss. Pistons' bench power Ish Smith (right adductor muscle tear) and Stanley Johnson (sore left knee) are out of action which is pinching the team and is clearly visible. Jimmy Butler was the scoring leader with 38 points. Simmons added 18 points, 14 rebounds and 6 assists with amazing defensive plays in the game. J.J. Redick and Mike Muscala also recorded 18 points apiece. Here are three talking points from the match. Jimmy Butler scored his 26 of 38 points in the second half to ensure Sixers' victory. He ended with 38 points, 6 rebounds and 6 assists. He shot 13-27 from the field. This was his consecutive 38 points game, he dropped 38 points on Wednesday's loss against Raptors. 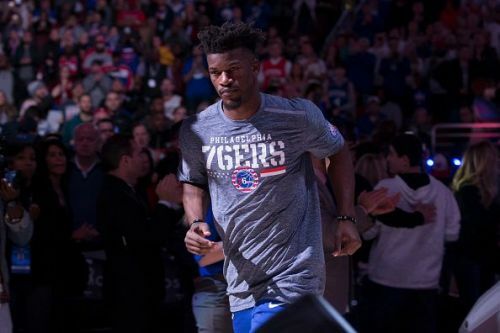 He is keeping his All-Star form intact and has played a heavy influence in the Sixers' wins recently. Butler also had some heated moments with Griffin when the game was nearing climax. Griffin also got a technical foul because of that. But Butler had the last laugh as he helped Sixers seal the win.